What are the most popular online bachelor's degrees offered in South Dakota? South Dakota is one of 12 states in the Midwestern Higher Education Compact (MHEC). Residents of participating states in this collaborative have access to several benefits, including the Midwest Student Exchange Program (MSEP), a tuition reciprocity agreement that offers out-of-state students tuition discounts and programs unavailable in their home states. Students in South Dakota can also take advantage of resources provided by the Electronic University Consortium (EUC), which acts as a single point of contact for distance learners who attend one of the six accredited public universities across the state. Online courses offer a variety of advantages to students, and the EUC is committed to helping working adults, part-time students, employees seeking career development, people with disabilities, and military personnel. Administrators in South Dakota have always been at the forefront of the online learning movement, and the South Dakota Department of Education founded the South Dakota Virtual School to give middle and high school students the same advantages that college students have when it comes to distance learning: choice, flexibility, and a quality curriculum. Thanks to the establishment of accredited online colleges in South Dakota, thousands of students who wouldn't have otherwise been able to pursue a college education can now do so in the comfort of their own home, on their own schedule, and for a price that fits their budget. Offering all of its online courses through the Desire2Learn digital platform, SDSU gives students the opportunity to earn bachelor's degrees in geography, interdisciplinary studies, medical laboratory science, nursing, and sociology. It also has online master's programs in chemistry, educational administration, public health, and sociology, among others. These rigorous programs, combined with the exceptional support the university provides for students, making SDSU one of the best online colleges in South Dakota. Applications for SDSU are accepted on a rolling basis. Undergraduate students are required to provide ACT scores and high school transcripts. Graduate-level students may have varying requirements based on the program, but generally they need to have obtained a bachelor's degree from an accredited postsecondary institution. SDSU is located in Brookings, a community of about 22,000 people in the eastern part of the state. Designed for students who either want to take a single class or work towards a degree, Northern State in Aberdeen is one of the best online colleges in South Dakota. The university offers online master's degrees in banking and financial services, leadership and administration, teaching and learning, and music education. Undergraduate programs are offered in a variety of subject areas, ranging from arts to sports marketing. Thanks to Northern State's reciprocity arrangements, in-state or discounted tuition rates are available for students who reside in South Dakota, North Dakota, Iowa, or Minnesota. The university also has financial aid and scholarships for active military members and veterans, along with opportunities for their spouses and other family members. In most cases, students are able to complete their online bachelor's degree in four years or fewer, while most master's programs are on a two-year schedule. Students may opt to attend either part time or full time. With its campus located in Madison, DSU is one of the top online colleges in South Dakota. The school is stands out for its main campus’s long history, dating back to 1881. Today, DSU offers a variety of online degree programs that are both high quality and affordable, while providing the flexibility students need to continue to meet their personal and professional obligations. In all, DSU has 32 bachelor's degree programs completely online, with available majors running the gamut from accounting and biology to management and finance. There are also online associate degree programs in business management, general studies, health information technology, network security, and respiratory care. DSU offers several online certificate programs for mid-career professionals. Applicants must have a high school diploma or GED high school equivalency certificate to be eligible for admission. The South Dakota School of Mines and Technology, founded in 1885 in Rapid City, is one of the best online schools in South Dakota and started as a school to provide instruction in the primary industry of the region: mining. The school has become one of the leading engineering and science universities in the region. The campus is located in the Black Hills of South Dakota and promotes small class sizes, which provides an individualized educational experience. SD Mines offers three online engineering master's programs: construction engineering and management, engineering management, and mining engineering and management. These programs are designed for students who hold a bachelor of science in science or engineering. The construction engineering and engineering management programs allow learners to transfer up to 12 credits. Black Hills State University, founded in 1883 in Spearfish, South Dakota, is home to about 4,500 students. The university is the region's leading school in sustainability efforts and is one of the best online colleges in South Dakota. Several degree programs at BHSU are offered online including bachelor's, master's, and certification programs. Undergraduate degrees are available online in business administration or general studies. BHSU uses the Desire2Learn online learning platform and provides technical support. Online students have access to all on-campus resources and facilities, including the counseling center, writing center, and library. BHSU boasts affordable tuition costs and also offers financial aid opportunities, including scholarships, student loans, and grants. Our affordability methodology considers value-driven metrics and ranks schools that have low tuition rates, as well as proven graduation rates and employment outcomes that provide a high ROI for students. For students in South Dakota, there are plenty of opportunities to find an affordable program locally. While distance education provides more flexibility than an exclusively residential curriculum, there are still plenty of advantages to attending a local online college, including access to lower tuition prices and local scholarships. If you're considering going back to school, and are thinking about studying online, the following list of cheap accredited online colleges in South Dakota will help you start your search. USD offers more than 40 online bachelor's, master's, and graduate programs, in subjects such as business, arts and sciences, health sciences, and education. This school is one of the most affordable online colleges in South Dakota, offering the same low tuition rate for distance learners. All programs are taught by the same faculty that teach on-campus courses. Online courses are delivered asynchronously, allowing students to complete coursework at their own pace. Applicants to USD Online must have a high school diploma or GED and submit SAT or ACT scores to be considered. SDSU's Continuing and Distance Education department offers more than 30 online programs, including undergraduate and graduate degrees as well as a variety of certificates. The school is one of the largest online colleges in South Dakota and is regularly adding new programs. For example, fall 2017 was the first semester that the school offered its BS in psychology program. Online courses are delivered both synchronously and asynchronously through Desire2Learn. All distance learners at SDSU pay the same tuition rate, regardless of residency. This makes SDSU one of the most affordable online colleges in South Dakota. The school also responds to all applications within 24-48 hours of submission. Applicants must have a high school diploma and submit ACT scores to be considered. DSU offers online programs that emphasize synchronous learning, with distance learners meeting at the same times as their on-campus counterparts and even collaborating with them on some projects. The school offers more than 30 undergraduate degrees, graduate programs, and certificates online, although offerings vary from state to state. These degrees cover topics such as business, health, teaching, and technology. DSU is one of the most affordable online colleges in South Dakota, offering in-state tuition rates to all distance learners. DSU is friendly to transfer students, accepting all students who have completed at least 24 credits of previous college credit with a minimum GPA of 2.0. High school applicants must have a high school diploma with a minimum GPA of 2.4 to be considered. NSU offers a variety of online programs that delivers coursework asynchronously, allowing students to complete coursework at their own pace. The school offers online undergraduate and graduate degrees in 11 areas, including banking, teaching, and general studies. Northern is one of the most affordable online colleges in South Dakota, offering in-state tuition to all distance learners. Freshman applicants must meet one of the following three requirements: top 60% of high school class, minimum GPA of 2.6, ACT score of at least 18. Northern is friendly to transfer students, accepting all applicants who have a minimum GPA of 2.0 and have been in good standing at their previous school. BHSU offers a total of 10 online or blended programs, including bachelor's and master's degrees as well as a variety of certifications. These offerings include three entirely online programs: a BS in business administration and MS degrees in strategic leadership and curriculum and instruction. Freshman applicants must submit official transcripts and SAT or ACT scores to be considered. Transfer applicants must have a minimum GPA of 2.0 from all previous academic institutions to be considered. However, those with a lower GPA may be allowed to enter on academic probation. USF is a private Christian university that is one of the only schools in the state to offer faith-based online coursework. The school offers a total of nine bachelor's and master's programs on topics like business, education, and nursing. All online students at USF pay the same tuition rate, regardless of residency. USF is one of the most affordable online colleges in South Dakota, with 100% of incoming freshman students receiving some form of financial aid. The school also offers a variety of scholarships to an additional 600 students. Recognizing the need for far-reaching education initiatives to accommodate its sparse population, South Dakota has increased online offerings at its major colleges and universities in recent years. While tuition and fees at public, four-year South Dakota colleges have increased by 38.3% over the last five years, state funding for postsecondary education increased by only 0.4%. Given these figures, more college students in South Dakota are enrolling in online programs, where tuition costs are considerably more affordable. South Dakota has enacted several initiatives designed to provide greater access to higher education, promote career training and build the local workforce in the state. Through its SD Wins project, for example, South Dakota Workforce Initiatives supports services ranging from college prep to career opportunities in technology and healthcare in South Dakota. Additional statewide initiatives that share a similar objective include the Civics Education Initiative, with a focus on high school education, and the 21st-Century Skills Initiative, which promotes the importance of modern technology and media skills in today's economy. 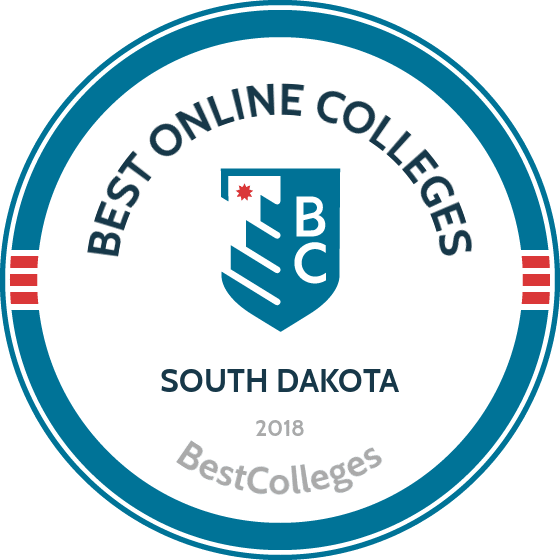 Browse our list of the best online colleges in South Dakota for more insight into distance learning programs in this state. As of fall 2012 enrollment, NCES reports indicate that 15% (6,424) of students in South Dakota's Title IV institutions were enrolled in exclusively online programs. The South Dakota Department of Education has pushed forward several online education initiatives for students of all ages. Among the state's most widely known efforts is the South Dakota Virtual School, an online consortium of distance education providers which currently serves more than 4,000 students. Employment growth in this profession is strong in South Dakota. According to the South Dakota Department of Labor & Regulation, long term projections show an increase of 23% in the total number of jobs between 2014 and 2024. Wages increased by 16% from 2011-2016. In 2016, what were the top careers in South Dakota for people who had a degree in business administration and management? Data source: South Dakota Department of Labor & Regulation, Bureau of Labor Statistics. Data may not be available for every year. Employment growth in this profession is moderate in South Dakota. According to the South Dakota Department of Labor & Regulation, long term projections show an increase of 13% in the total number of jobs between 2014 and 2024. Wages increased by 5% from 2011-2016. In 2016, what were the top careers in South Dakota for people who had a degree in registered nursing? In 2016, what were the top careers in South Dakota for people who had a degree in marketing/marketing management? Currently, no schools in South Dakota offer an online bachelor's degree program in marketing/marketing management. Employment growth in this profession is strong in South Dakota. According to the South Dakota Department of Labor & Regulation, long term projections show an increase of 24% in the total number of jobs between 2014 and 2024. Wages increased by 15% from 2011-2016. In 2016, what were the top careers in South Dakota for people who had a degree in accounting?